Jan. 7, 2010, 2:11 p.m.
By Martin Langeveld @MartinLangeveld Jan. 7, 2010, 2:11 p.m. PREDICTION: No other newspaper companies will file for bankruptcy. WRONG. By the end of 2008, only Tribune had declared. Since then, the Star-Tribune, the Chicago Sun-Times, Journal Register Company, and the Philadelphia newspapers made trips to the courthouse, most of them right after the first of the year. PREDICTION: Several cities, besides Denver, that today still have multiple daily newspapers will become single-newspaper towns. RIGHT: Hearst closed the Seattle Post-Intelligencer (in print, at least), Gannett closed the Tucson Citizen, making those cities one-paper towns. In February, Clarity Media Group closed the Baltimore Examiner, a free daily, leaving the field to the Sun. And Freedom is closing the East Valley Tribune in Mesa, which cuts out a nearby competitor in the Phoenix metro area. PREDICTION: Whatever gets announced by the Detroit Newspaper Partnership in terms of frequency reduction will be emulated in several more cities (including both single and multiple newspaper markets) within the first half of the year. WRONG: Nothing similar to the Detroit arrangement has been tried elsewhere. PREDICTION: Even if both papers in Detroit somehow maintain a seven-day schedule, we’ll see several other major cities and a dozen or more smaller markets cut back from six or seven days to one to four days per week. WRONG, mostly: We did see a few other outright closings including the Ann Arbor News (with a replacement paper published twice a week), and some eliminations of one or two publishing days. But only the Register-Pajaronian of Watsonville, Calif. announced it will go from six days to three, back in January. PREDICTION: As part of that shift, some major dailies will switch their Sunday package fully to Saturday and drop Sunday publication entirely. They will see this step as saving production cost, increasing sales via longer shelf life in stores, improving results for advertisers, and driving more weekend website traffic. The “weekend edition” will be more feature-y, less news-y. WRONG: This really falls in the department of wishful thinking; it’s a strategy I’ve been advocating for the last year or so to follow the audience to the web, jettison the overhead of printing and delivery, but retain the most profitable portion of the print product. PREDICTION: There will be at least one, and probably several, mergers between some of the top newspaper chains in the country. Top candidate: Media News merges with Hearst. Dow Jones will finally shed Ottaway in a deal engineered by Boston Herald owner (and recently-appointed Ottaway chief) Pat Purcell. WRONG AGAIN, but this one is going back into the 2010 hopper. Lack of capital by most of the players, and the perception or hope that values may improve, put a big damper on mergers and acquisitions, but there should be renewed interest ahead. PREDICTION: Google will not buy the New York Times Co., or any other media property. Google is smart enough to stick with its business, which is organizing information, not generating content. On the other hand, Amazon may decide that they are in the content business…And then there’s the long shot possibility that Michael Bloomberg loses his re-election bid next fall, which might generate a 2010 prediction, if NYT is still independent at that point. RIGHT about Google, and NOT APPLICABLE about Bloomberg (but Bloomberg did acquire BusinessWeek). The Google-NYT pipe dream still gets mentioned on occasion, but it won’t happen. WRONG, at least on the mini-bust scenario. Certainly there were closings of various digital enterprises, but it didn’t look like a tidal wave. PREDICTION: The fifty newspaper execs who gathered at API’s November Summit for an Industry in Crisis will not bother to reconvene six months later (which would be April) as they agreed to do. PREDICTION: Newspaper advertising revenue will decline year-over-year 10 percent in the first quarter and 5 percent in the second. It will stabilize, or nearly so, in the second half, but will have a loss for the year. For the year, newspapers will slip below 12 percent of total advertising revenue (from 15 percent in 2007 and around 13.5 percent in 2008). But online advertising at newspaper sites will resume strong upward growth. WRONG, and way too optimistic. Full-year results won’t be known for months, but the first three quarters have seen losses in the 30 percent ballpark. Gannett and New York Times have suggested Q4 will come in “better” at “only” about 25 percent down. My 12 percent reference was to newspaper share of the total ad market, a metric that has become harder to track this year due to changes in methodology at McCann, but the actual for 2009 ultimately will sugar out at about 10 percent. PREDICTION: Newspaper circulation, aggregated, will be steady (up or down no more than 1 percent) in each of the 6-month ABC reporting periods ending March 31 and September 30. Losses in print circulation will be offset by gains in ABC-countable paid digital subscriptions, including facsimile editions and e-reader editions. WRONG, and also way too optimistic. The March period drop was 7.1 percent, the September drop was 10.6 percent, and digital subscription didn’t have much impact. PREDICTION: At least 25 daily newspapers will close outright. This includes the Rocky Mountain News, and it will include other papers in multi-newspaper markets. But most closings will be in smaller markets. WRONG, and too pessimistic. About half a dozen daily papers closed for good during the year. PREDICTION: One hundred or more independent local startup sites focused on local news will be launched. A number of them will launch weekly newspapers, as well, repurposing the content they’ve already published online. Some of these enterprises are for-profit, some are nonprofit. There will be some steps toward formation of a national association of local online news publishers, perhaps initiated by one of the journalism schools. Hard to tell, but probably RIGHT. Nobody is really keeping track of how many hyperlocals are active, or their comings and goings. An authoritative central database would be a Good Thing. PREDICTION: The Dow Industrials will be up 15 percent for the year. The stocks of newspaper firms will beat the market. RIGHT. The Dow finished the year up 18.8 percent. (This prediction is the one that got the most “you must be dreaming” reactions last year. And RIGHT about newspapers beating the market (as measured by the Dow Industrials), which got even bigger laughs from the skeptics. There is no index of newspaper stocks, but on the whole, they’ve done well. It helps to have started in the sub-basement at year-end 2008, of course, which was the basis of my prediction. Among those beating the Dow, based on numbers gathered by Poynter’s Rick Edmonds, were New York Times (+69%), AH Belo (+164%), Lee Enterprises (+746%), McClatchy (+343%), Journal Communications (+59%), EW Scripps (+215%), Media General (+348%), and Gannett (+86%). Only Washington Post Co. (+13%) lagged the market. Not listed, of course, are those still in bankruptcy. PREDICTION: At least one publicly-owned newspaper chain will go private. PREDICTION: A survey will show that the median age of people reading a printed newspaper at least 5 days per week is is now over 60. UNKNOWN: I’m not aware of a 2009 survey of this metric, but I’ll wager that the median age figure is correct. PREDICTION: Reading news on a Kindle or other e-reader will grow by leaps and bounds. E-readers will be the hot gadget of the year. The New York Times, which currently has over 10,000 subscribers on Kindle, will push that number to 75,000. The Times will report that 75 percent of these subscribers were not previously readers of the print edition, and half of them are under 40. The Wall Street Journal and Washington Post will not be far behind in e-reader subscriptions. UNKNOWN, as far as the subscription counts go: newspapers and Kindle have not announced e-reader subscription levels during the year. The Times now has at least 30,000, as does the Wall Street Journal (according to a post by Staci Kramer in November; see my comment there as well). There have been a number of new e-reader introductions, but none of them look much better than their predecessors as news readers. My guess would be that by year end, the Times will have closer to 40,000 Kindle readers and the Journal 35,000. During 2010, 75,000 should be attainable for the Times, especially counting all e-editions (which include the Times Reader and 53,353 weekdays and 34,435 Sundays for the six months ending Sept. 30. PREDICTION: The advent of a color Kindle (or other brand color e-reader) will be rumored in November 2009, but won’t be introduced before the end of the year. RIGHT: plenty of rumors, but no color e-reader, except Fujitsu’s Flepia, which is expensive, experimental, and only for sale in Japan. PREDICTION: Some newspaper companies will buy or launch news aggregation sites. Others will find ways to collaborate with aggregators. RIGHT: Hearst launched its topic pages site LMK.com. And various companies are working with EVRI, Daylife and others to bring aggregated feeds to their sites. PREDICTION: As newsrooms, with or without corporate direction, begin to truly embrace an online-first culture, outbound links embedded in news copy, blog-style, as well as standalone outbound linking, will proliferate on newspaper sites. A reporter without an active blog will start to be seen as a dinosaur. MORE WISHFUL THINKING, although there’s progress. Many reporters still don’t blog, still don’t tweet, and many papers are still on content management systems that inhibit embedded links. PREDICTION: The Reuters-Politico deal will inspire other networking arrangements whereby one content generator shares content with others, in return for right to place ads on the participating web sites on a revenue-sharing basis. YES, we’re seeing more sharing of content, with various financial arrangements. PREDICTION: The Obama administration will launch a White House wiki to help citizens follow the Changes, and in time will add staff blogs, public commenting, and other public interaction. NOT SO FAR, although a new Open Government Initiative was recently announced by the White House. This grew out of some wiki-like public input earlier in the year. PREDICTION: The Washington Post will launch a news wiki with pages on current news topics that will be updated with new developments. YES — kicked off in January, it’s called WhoRunsGov.com. PREDICTION: The New York Times will launch a sophisticated new Facebook application built around news content. The basic idea will be that the content of the news (and advertising) package you get by being a Times fan on Facebook will be influenced by the interests and social connections you have established on Facebook. There will be discussion of, if not experimentation with, applying a personal CPM based on social connections, which could result in a rewards system for participating individuals. NO. Although the Times has continued to come out with innovative online experiments, this was not one of them. PREDICTION: Craigslist will partner with a newspaper consortium in a project to generate and deliver classified advertising. There will be no new revenue in the model, but the goal will be to get more people to go to newspaper web sites to find classified ads. There will be talk of expanding this collaboration to include eBay. NO. This still seems like a good idea, but probably it should have happened in 2006 and the opportunity has passed. PREDICTION: Look for some big deals among the social networks. In particular, Twitter will begin to falter as it proves to be unable to identify a clearly attainable revenue stream. By year-end, it will either be acquired or will be seeking to merge or be acquired. The most likely buyer remains Facebook, but interest will come from others as well and Twitter will work hard to generate an auction that produces a high valuation for the company. PREDICTION: Some innovative new approaches to journalism will emanate from Cedar Rapids, Iowa. YES, as described in this post and this post. See also the blogs of Steve Buttry and Chuck Peters. The Cedar Rapids Gazette and its affiliated TV station and web site are in the process of reinventing and reconstructing their entire workflow for news gathering and distribution. PREDICTION: A major motion picture or HBO series featuring a journalism theme (perhaps a blogger involved in saving the world from nefarious schemes) will generate renewed interest in journalism as a career. I’d agree with most, although (a) I think there will be at least one other newspaper company bankruptcy, (b) I think Q3/Q4 revenue numbers will be down from 2008, not flat, (c) circ will be down, not stable, (d) newspaper stocks won’t beat the market, (e) the Kindle boom won’t be as big as he thinks for newspapers, and (f) Twitter won’t be in major trouble in  — Facebook is more likely to feel the pinch with its high server-farm costs. 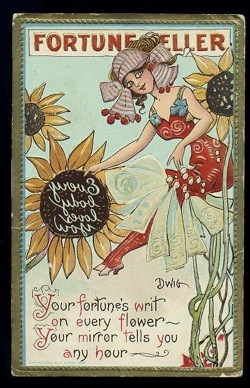 Photo of fortune-teller postcard by Cheryl Hicks used under a Creative Commons license. POSTED Jan. 7, 2010, 2:11 p.m.
Langeveld, Martin. "Keeping Martin honest: Checking on Langeveld’s predictions for 2009." Nieman Journalism Lab. Nieman Foundation for Journalism at Harvard, 7 Jan. 2010. Web. 19 Apr. 2019. Langeveld, Martin. "Keeping Martin honest: Checking on Langeveld’s predictions for 2009." Nieman Journalism Lab. Last modified January 7, 2010. Accessed April 19, 2019. https://www.niemanlab.org/2010/01/keeping-martin-honest-checking-on-langeveld%e2%80%99s-predictions-for-2009/.